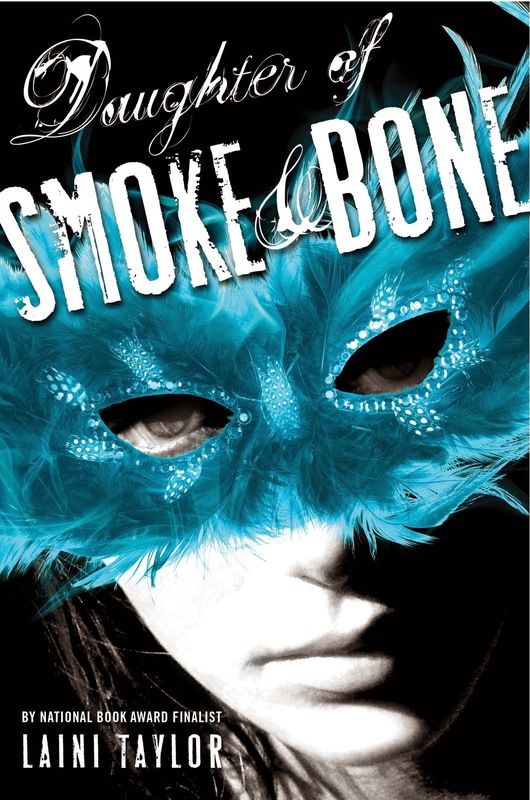 I have heard so much about Daughter of Smoke and Bone by Laini Taylor and wanted to read and review it since it came out in 201. And now I finally have - just in time for the release of Dreams of Gods and Monsters, the third book in the Declaration Trilogy. Reading Daughter of Smoke and Bone by Laini Taylor is a bit like following a trail of breadcrumbs through a tunnel - you don't know where it's leading you, but you really want to see the light a the end. Taylor masterfully withholds crucial information about characters, weaving these missing memories and knowledge into the characters themselves. Taylor has the courage to begin Daughter of Smoke and Bone, "Once upon a time," and she follows through with a modern-ancient-love story that is, above all else, epic. The worlds that she creates are so layered and detailed and Taylor is such a beautiful writer, so generous with her words and time when it comes to these worlds, that it's hard not to get caught up in sharing the intricate details. You don't know that this is an epic love story when the novel begins and I don't think I am giving too much away by saying so here. When we meet Karou in the beginning chapters of Daughter of Smoke and Bone she is a blue-haired, seventeen year old student at the Art Lyceum of Prague who has notebooks upon notebooks filled with drawings of monsters she has named and given backstories to. Taylor throws out an initial diversion in the character of Kazimir, the devastatingly handsome older ex-boyfriend who has a job dressing like a vampire and skulking in the dark alleyways of Prague, jumping out at tour groups. He torments Karou by taking the job of model in her life drawing class and we begin to see that her blue hair is not the only thing different about Karou as she uses her gifts, gathered on a string of beads around her neck, to torment him back. Taylor spends a generous amount of time in Prague creating the world that Karou lives in with her best friend, the pixie-like puppeteer Zuzana and her musician boyfriend, Mik - so much so that I almost wish the whole novel had been set there. She describes the goulash house they frequent, Karou's incredible, high-windowed flat and Zuzana's amazing senior project for which she creates a monumental puppeteer and poses as his puppet, performing on the Charles Bridge. But the real story lies elsewhere, in the hole that Karou feels in her life, the emptiness that is always with her, the knowledge that is withheld from her by those she is closest to. This hole is partially filled by Karou's secret life with the monsters - chimaera - that fill her sketchbooks. There is her father figure, the chimera Brimstone, the dark wizard who collects teeth from all living (and sometimes dead) creatures and strings them together in various combinations. Karou is frequently sent all over the world to retrieve these teeth, but for what, exactly, she has no true idea. Heavily scarred, Brimstone possesses the torso and of a human, the head of a reptilian ram and the legs of a lion with raptor-like feet. His familiar, Kishmesh, a crow-like bird with bat wings, perches on his horns when not taking messages to Karou in her world. Brimstone's shop hovers between his world of Eretz and Karou's world on Earth. She spent her childhood in his shop along with Issa, half-woman, half serpent who decorates herself with snakes rather than clothing, Twiga, the giraffe-necked assistant jeweler and Yasri, Brimstone's cook who has a human head and a parrot beak. While Karou does not know the true nature of Brimstone's work, she does know that teeth equal wishes, and that wishes, like money, come in various values. Brimstone often pays Karou in scuppies and shings and with these she has made wishes that turned her hair permanently blue, given her the ability to speak handfuls of languages and turned the eyebrows of the beautiful object of Kazimir's affection into caterpillars that grow back the moment they were tweezed. But this all falls away when black handprints are found burned into the doors that are Karou's entry to Brimstone's shop, and she quickly learns why. At a market in Marrakesh where she has gone to make what will be her last trip for Brimstone, she meets up with Izîl, a once prosperous man whose wish for knowledge, made by pulling out his own teeth in exchange for a bruxis, went horribly wrong and left him with a fallen angel, hideously broken and invisible to humans, constantly clinging to his back and whining in his ear. Taylor's writing can be every bit as wrought and cruel as it is frequently beautiful and poetic and Izîl and his constant companion Razgut are an example of this. Through Izîl and Razgut, the dispenser of the black hands learns of Karou, and, not knowing who or what she is, he is inexplicably drawn to her. This is Akiva, a devastatingly handsome seraph, and the first time he meets Karou he almost kills her. The second time they meet, she almost kills him. While she metes out quite a beating, it is the hamsas tattooed on her palms that do the most damage to Akiva, burning him intensely, although she doesn't know why or even why she has them. Despite these battles, the two share a connection that they cannot deny, a connection that, without giving too much away, began before Karou was even born and adds fuel to the raging war between the seraphim and chimaera that is destroying Eretz. 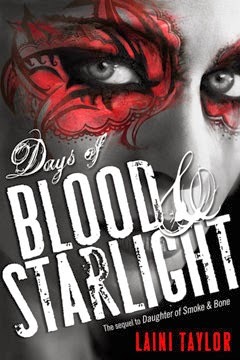 As with all aspects of her novel, Taylor writes intricately and intimately of the intense, mystifying feelings that Karou and Akiva find they have for each other and readers wanting a true romance will be very gratified. And here, I have only reached the halfway point of Daughter of Smoke and Bone. Many questions are answered before the end of the novel, but some are not. Much like Philip Pullman's remarkable trilogy, His Dark Materials, the first book feels almost complete in and of itself, but leaves you desperately wanting to know more about these worlds and the humans, chimaera and seraphim who inhabit them. And, like Pullman's trilogy, but without the same theological bent, Taylor invents creation myths, mythologies, gods and goddesses for the seraphim and chimaera and interweaves this with philosophical questions, bringing up issues relating to racial superiority that run deep throughout the story. This book is intense on so many levels, but, as I said above, it is also a love story, one that teens will (and have in mass quantities) eat up. As a huge fan of audio books, I always like to give credit to the voice actors who give these books life off the page. Khristine Hvam brilliantly narrated Daughter of Smoke and Bone with a range of character voices and accents that added so much to the story. She won the Audible Award in the fantasy category for her work on Taylor's book and it's well deserved.